These fritters are traditionally made with salt cod, but work well with crab. They are referred to as one of the original fast foods of Jamaica and can be seen sold at the roadside for breakfast. Mix together all the fritter ingredients except the oil and watercress, season and divide into 8 pieces. With wet hands, mould into flat-round shapes. Heat the oil in a frying pan and fry the fritters for 1-11⁄2 minutes each side until golden. 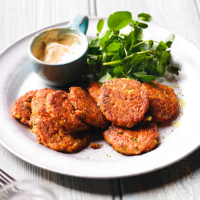 Meanwhile, mix the mayonnaise and pepper sauce and serve with the fritters on a bed of watercress.